Filipinos have a number of options to take with their traditional kape (coffee): breads and pastries like pandesal, ensaymada (buttery sweet rolls covered with cheese), hopia (pastries similar to mooncakes filled with sweet bean paste) and empanada (savory pastries stuffed with meat). There's also the option of cakes made with sticky rice (kakanin) like kutsinta, sapin-sapin, palitaw, biko, suman, bibingka, and pitsi-pitsi. 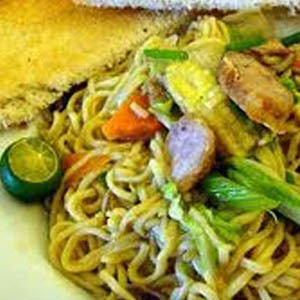 Savory dishes often eaten during merienda include pancit canton (stir-fried noodles), palabok (rice noodles with a shrimp-based sauce), tokwa't baboy (fried tofu with boiled pork ears in a garlic-flavored soy sauce and vinegar sauce), and dinuguan (a spicy stew made with pork blood) which is often served with puto (steamed rice flour cakes). Dim sum and dumplings, brought over by the Fujianese people, have been given a Filipino touch and are often eaten for merienda. Street food, most of which are skewered on bamboo sticks, such as squid balls, fish balls and others, are common choices too.